World Environment Day is celebrated on the 5th June every year. I cannot remember posting anything about this day in all of the years I have been writing on this site. This is a first for me. I live on the edge of a large country town in South Australia. My property is about 2 hectares (5 acres) in size, with over half of it either natural scrubland (mallee trees), or planted trees and shrubs. I have lived on this property for well over 30 years and have kept a bird list for all of that time. 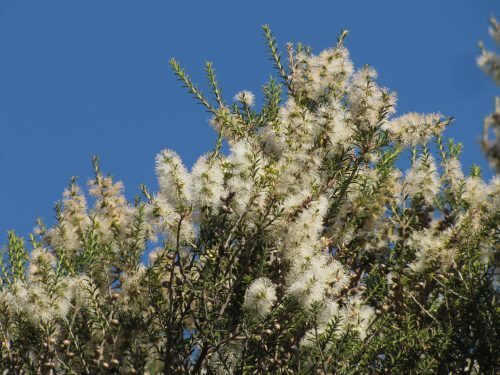 The current list has reached 112 different species, the high number due in part to the presence of suitable habitat for a wide range of species. Over those years we have planted many hundreds of trees and shrubs in addition to those occurring naturally. Not only have we taken delight in the wide range of birds that visit or are resident, we also enjoy the many flowering species of plants. Planting is one easy and very rewarding way of improving the environment. 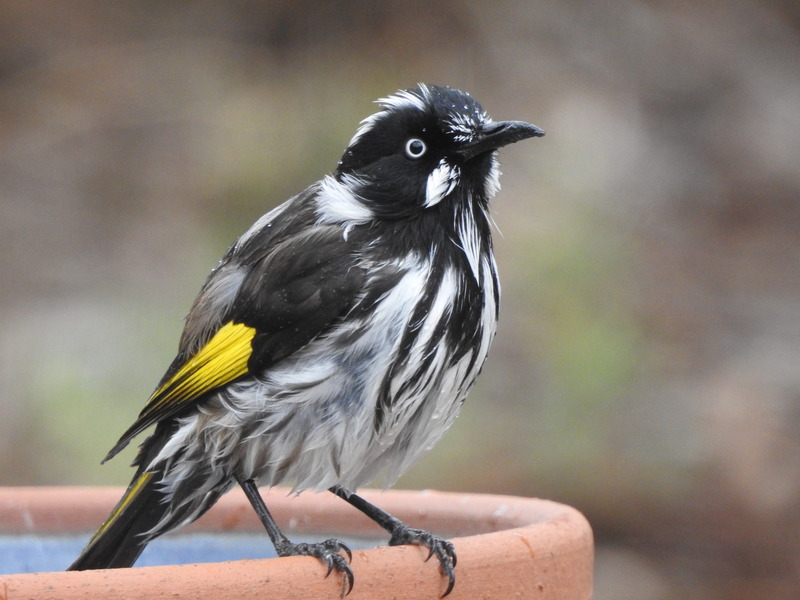 Even if you only have a small courtyard for a garden, having a few plants – both native and exotic – will attract our native birds for you to enjoy. The same could be said for those who live in a high-rise apartment with a balcony. Even having five or six plants in pots improves the environment, as well as helping your own well-being. 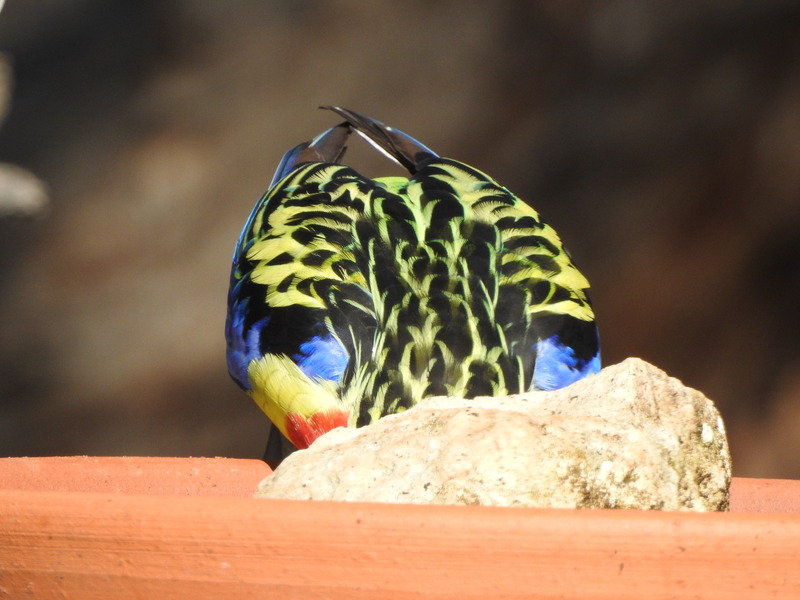 Another way I like to encourage the birds in my garden is to have several bird baths. I have placed these within close viewing distance from our sunroom. Over the years this has given me much pleasure. On really hot days, the birds flock to the baths in large numbers, either to drink or to bathe. Today I have included some recent photos taken of birds which have visited my bird baths. 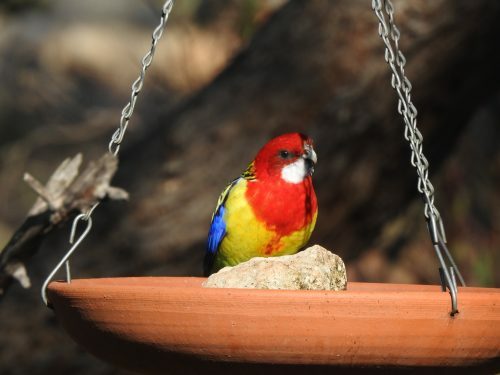 These were all taken when the weather was much cooler than our hot summer days, so even in cool weather, we have the delight of many birds coming to visit the bird baths. 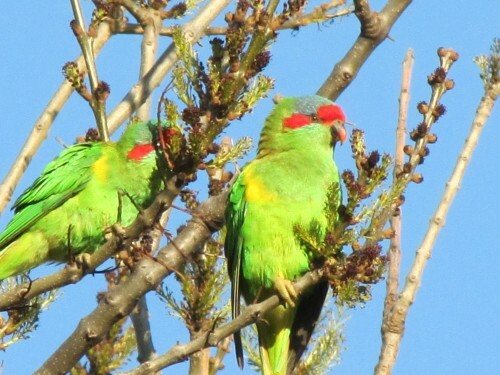 Over recent years we have had a family of Australian Ringneck parrots move into our garden. Before that, they were only occasional visitors, but now we see – or hear – them every day. They can be raucous at times. I now consider them to be a resident breeding species in our garden. In fact, only last week I witnessed two of them mating, so we could have even more around in the next few months. 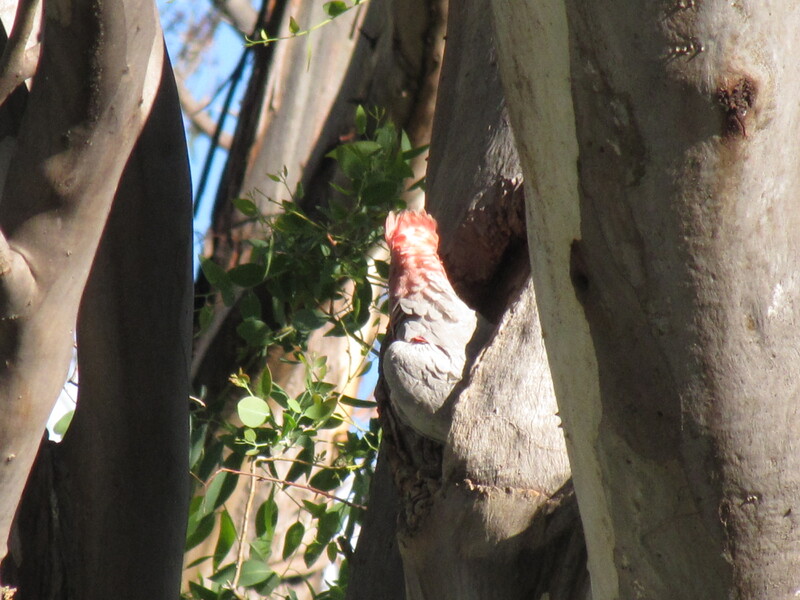 They have been constantly investigating a large hollow in one of our mallee trees. 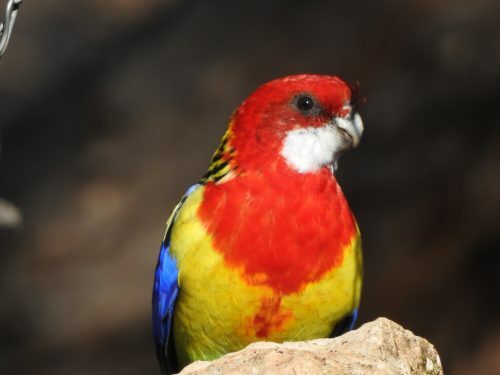 The birds we have here are the sub-species Mallee Ringnecks. At first, we only had two birds, but after breeding, there were more, and now we often count up to about eight birds in our garden, or in the nearby mallee scrub. They chatter away noisily in the nearby trees, often disturbing the peacefulness of our edge of town block of land. We don’t really mind because we love having them around. That is – until they attack our ripening pears, chewing around the stems of each piece of fruit. Each summer I have to drape netting over the trees to minimise the damage. Last week I was going out the sliding door on to our back veranda. I was heading out to sit in the weak winter sun to do some reading. 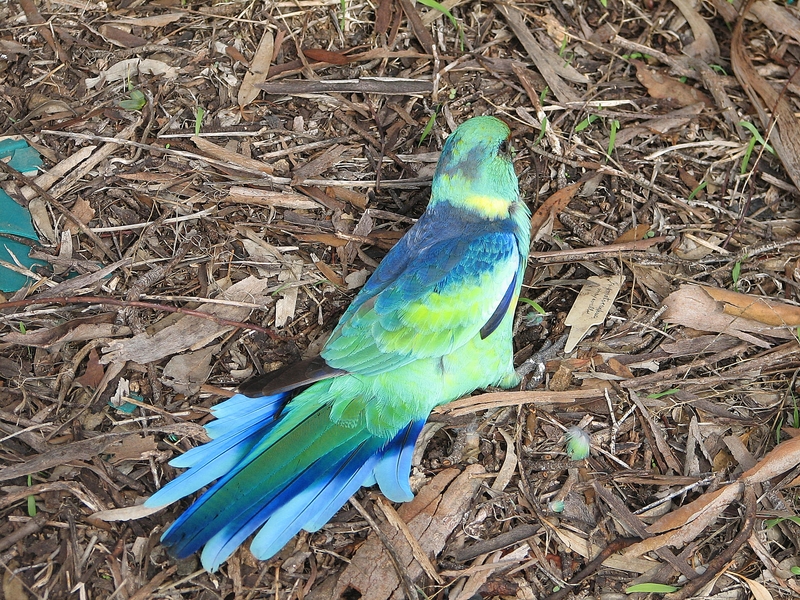 One of the parrots flew from the nearby tree towards the house just as I came out of the door. It was flying directly towards me, wings and tail spread out fan-like as it came to a stop, landing on the edge of the roof guttering. As the feathers spread out, I glimpsed the beautiful colours of this lovely bird. Sadly, I didn’t have my camera – it happened far too quickly, anyway. The photo at the top of this post shows the colourful feathers of one of our birds which accidentally flew into my office window last year. It sat on the ground quite stunned for a few minutes before flying off again. 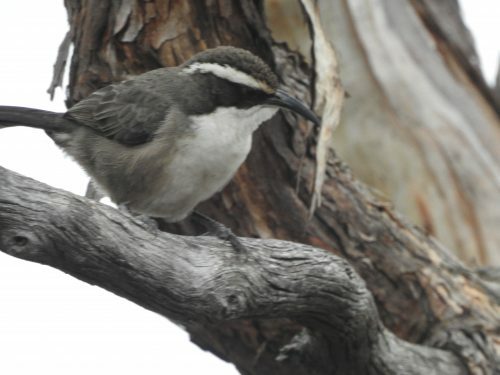 The photo below shows another shot of the same bird. Over recent days we have had an influx of lorikeets in our garden, on our property and along the road leading to our place here on the edge of Murray Bridge in South Australia. Normally, we have the odd flyover of a small group of Purple-crowned Lorikeets. 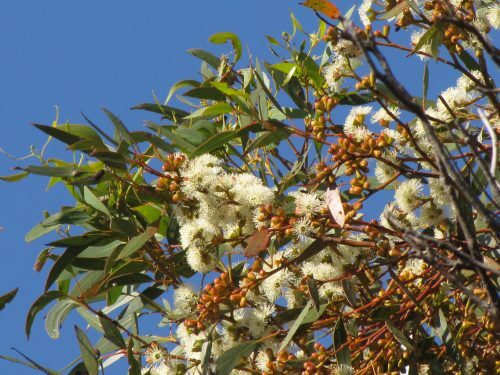 Occasionally they will land in one of our mallee trees for a short feed, depending on the extent of flowering at the time. They rarely stay for more than a few minutes. From time to time we also have Rainbow Lorikeets shooting across the tops of the trees at speed. They are often gone in a flash, flying like colourful arrows against a blue sky. They, too, rarely come to settle in our trees. 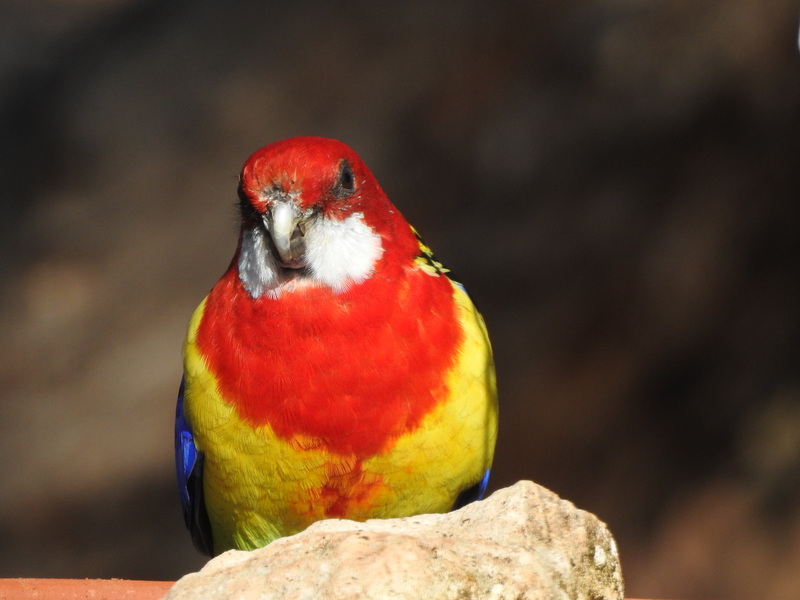 The current influx of Musk Lorikeets is somewhat unusual. It is the first time in over 12 years that I have recorded it here in our garden. (My database records only go back that far; I am progressively working back through them.) Although it is relatively common in this area, I haven’t recorded it in our garden in all those years. In fact, if my memory is correct, I have recorded this species in our garden on only a handful of previous occasions, all of them more than 12 years ago. Why the influx of Musk Lorikeets? The reasons are clear and far from complex. The last six to eight months have been exceptional from a weather point of view. From late mid-winter last July (2016) we have had well above average rainfall. This extra rain has produced one of the best flowering seasons for many years over the recent summer months (December – February). 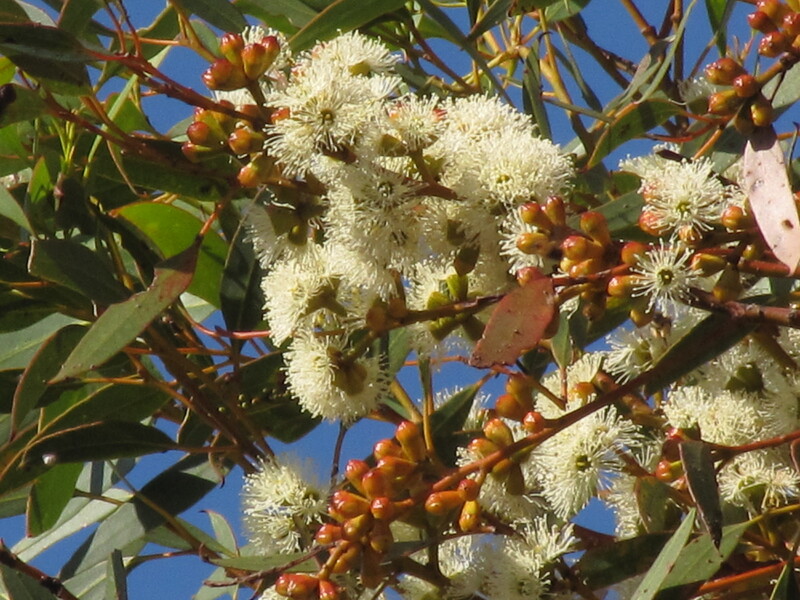 The eucalyptus mallee trees have flowered prolifically, along with many other local species of shrubs and bushes. 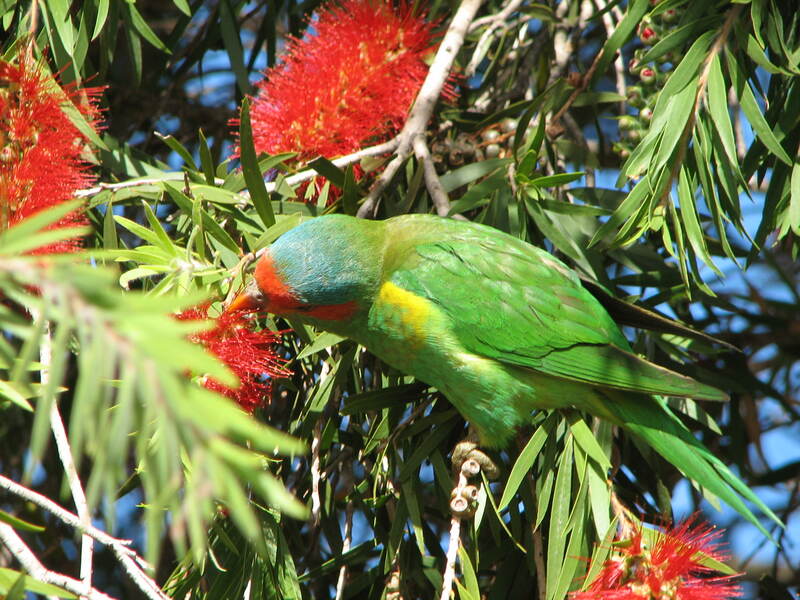 Being predominantly nectar eating birds, Musk Lorikeets have flocked to this area. I don’t mind; I love having them around. 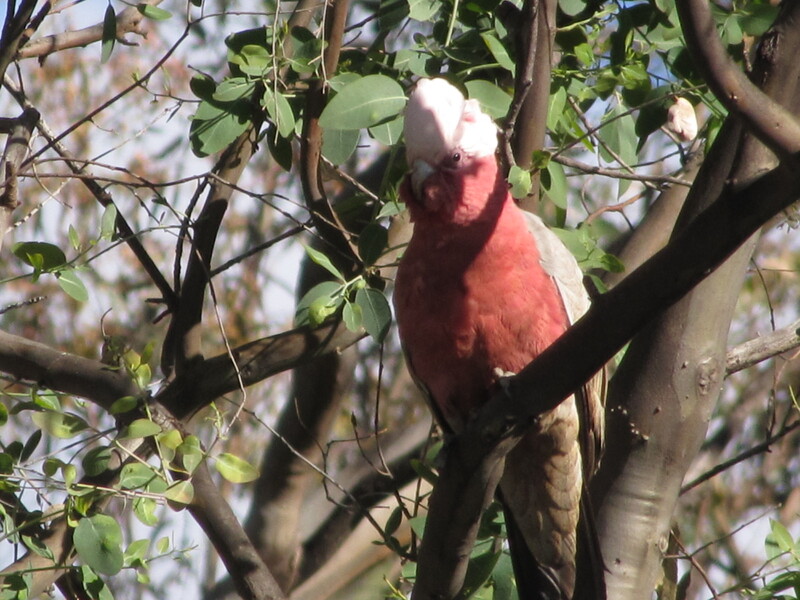 While I was watching them feeding in a mallee tree near to our house earlier this week, something spooked them. They flew off over our orchard, wheeled around to the north, then east and like green coloured screeching darts came hurtling back to the tree near me and recommenced feeding. As they flew, I estimated that there were some 40 to 50 birds, far more than one usually sees in a flock here. Having said that, I have seen large flocks flying together while visiting my daughter in Clare in the mid-north of South Australia. 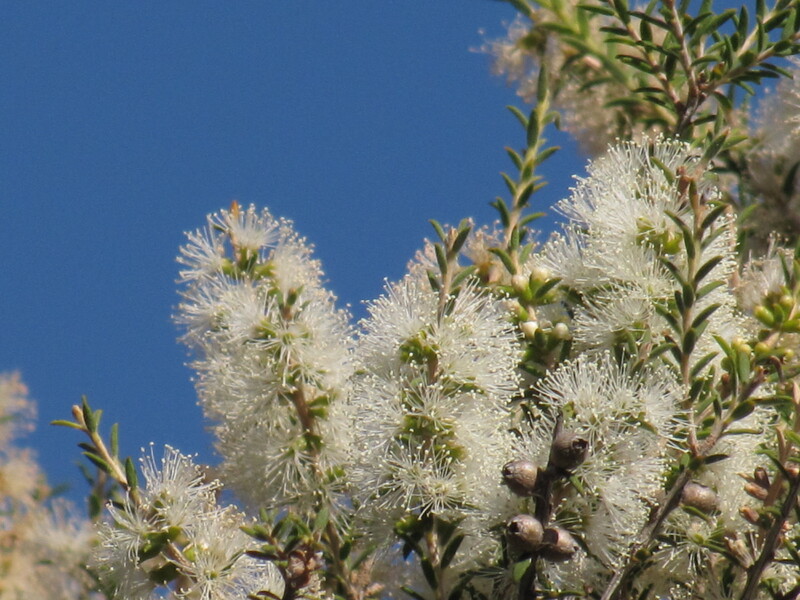 I have included below, several photos of some of the trees and bushes currently flowering in our garden. These are what the lorikeets have been feeding on. 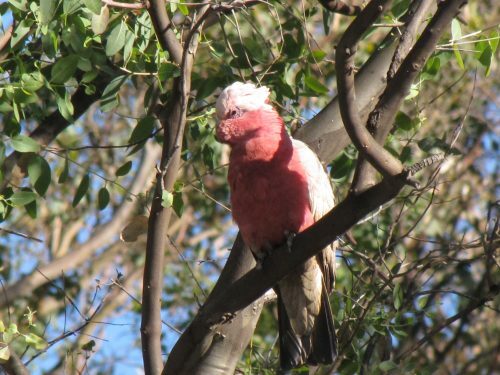 What are these Galahs up to? On our return trip from Sydney last year, we didn’t take the direct route home to Murray Bridge. Instead of taking two days to get home, we took a circuitous route through north-western New South Wales. We drove through Lithgow, Capertee Valley, Mudgee, Dunedoo, Cobar and Broken Hill. We saw some parts of the country we had never visited before, which is always an interesting way to travel. On our first night away from Sydney, we stopped at one of the caravan parks in the town of Mudgee. We arrived late in the afternoon. After we had unpacked and settled into the cabin, we sat on the front deck of the cabin enjoying the balmy evening and a nice cuppa. As we were sitting there I had my notebook and binoculars at the ready, as well as my camera. My attention was soon drawn to a Galah perched in a nearby tree. This tree was about 30 metres from where we sat. 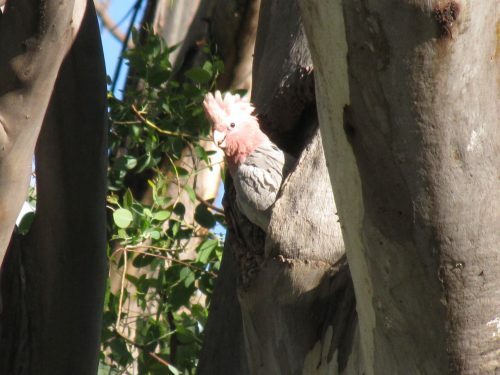 I noticed that the Galah was not attempting to fly away, but it was interested in what was happening further down the trunk. Another Galah, presumably its female mate, had emerged from a hollow there (see photos below). It looked as if the female was preparing the hollow ready for nesting. This was last Septemeber, right about the time they begin preparing nesting hollows for their next brood. I have no evidence that this pair went ahead and had a brood of young because we moved on elsewhere next morning. 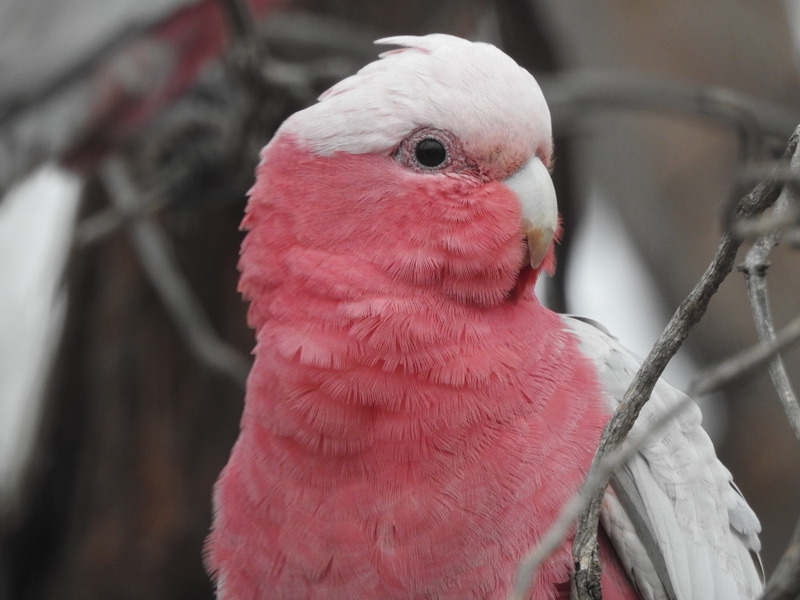 The Galah is one of Australia’s most recognisable parrots. 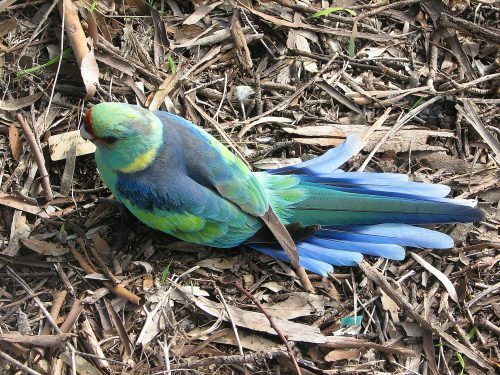 We have many colourful parrots in Australia – you can see photos of some of them by doing a search on this site. 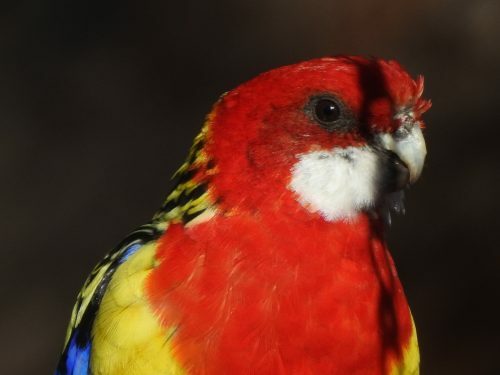 I have written frequently about parrots over the years and have included many photos of them. Some of these posts are included in “Further Reading” below. You are currently browsing the archives for the Parrots and Lorikeets category.